This is one of those happy times where the visualisation and the realisation align perfectly! There are a number of sweatshirt patterns around at the moment and it took me a while to decide which to buy: Linden? White Russian? Enid? They do all differ, and I may at some point buy another but this time it was the Linden that won out. Not sure why - I think maybe the relaxed shape was more what I was after, plus I have a good track record with Grainline patterns #grainlinefangirl. This was one of these garments where I knew in advance what I wanted to do - grey marl, with a quilted front. I bought the grey marl sweatshirt fabric in The Cloth Shop at a recent blogger meet up (I never wrote about it but you can read about it here and here). It's polyester - I know! Again! Danielle will never believe it. It might have something else in there - elastane or something - but I really can't remember. The Cloth Shop doesn't sell ribbing, so I consulted the list published by Jen. It was actually harder than I expected to find a grey marl ribbing, at a reasonable price. I didn't want to pay more for the ribbing than the main fabric! Good job, I like it! The garment went together really easily and quickly. The main garment consists of just 3 pieces: front, back and sleeve, and there are then 3 further ribbing pattern pieces. Fewer if you make the t-shirt view. And yay for raglan sleeves - no sleeves to set in!!! I have sewn a raglan pattern once before, and I seem to remember the sleeves being a nightmare. Not so this time, they went in beautifully. I took care to ensure the seams all matched at the underarm. But I am jumping ahead. I quilted the front bodice piece after cutting it out but before sewing the garment together. I stay stitched the neckline and raglan edge before I started, to stop any stretching out from handling. Using a scrap of fabric I did a few practice runs to get a grid size and stitch length I liked. I then drew the grid, using disappearing marker pen, and sewed along the lines. The ink disappeared quite quickly, so I drew 2 or 3 lines at a time and sewed them, drew another 3, and so on. I didn't think about placement, but by happy coincidence, the "diamonds" have ended up more or less centred. Win! The garment was constructed on my sewing machine, using the lightening bolt zigzag. I left the edges raw, apart from the seams attaching the ribbing, which I overlocked. I am still nervous about using the overlocker to actually hold something together, plus my overlocker doesn't appear to have any seam allowance markings. Speaking of seam allowance, it's only 1/4 inch on this pattern - something to bear in mind when you are marking your notches, if like me, you snip into the SA. I had to make my SA a little wider in places to accommodate my slightly overgenerous snips! I twin needled the neckline, as suggested in the pattern. My stretch twin needle is quite narrow, and wouldn't straddle the seam, so I sewed with the right needle "stitching in the ditch" and the left holding the seam allowance down. It's a little wobbly in places but fine. I think a wider set twin needle would give it a more professional look, though. I do have a couple of small fit issues. The neckline stands proud on my shoulders. It looks like it's been stretched out, but it was like this before I added the ribbing. I actually thought the ribbing would pull it in, but it obviously hasn't, and instead I now have some weird "bubbling" where the fleece wants to stick up, but the ribbing pulls it back down again. There also seems to be fabric pooling just beside underarm at the back. I've not overly sure how to fix either of these problems, so if you have any ideas feel free to jump in. I'm wondering if I can fix the neckline simply by increasing the seam allowance just at the top of each of the raglans, thus reducing the neckline circumference? *ETA* - I have just discovered that both Laney and Sew Charleston increased the SA to reduce gaping at the neckline, so definitely worth a try for the next one! Excess fabric pooling at the underarm. I'm really happy with the finished garment! As I said, it is pretty much exactly as I imagined. I love the wide neckline, which I think is more flattering than the usual crew neck. The fit is relaxed but not overly so. The contrast ribbing works well, and while the quilting is a bit more subtle than I expected, I think it works really well. And it's so cosy and snuggly!!! Perfect for the miserable weather we've been having recently. My last couple of makes of 2014 were selfless sews and my first makes of 2015 are also selfless. Firstly this, which was actually a Christmas present that never made it on time, so I figured I had better prioritise it. A while back, Small Boy casually asked "Mummy, can you sew me a superhero cape? And goggles?" To be fair, I never mentioned to him I was planning to make it as a Christmas present, so he doesn't know it's late, but he had been asking quite a bit, and I had the fabric to make it, so I had no excuses. I found this tutorial for the cape, which was really straightforward. It literally took less than an hour and a half from start to finish; I fitted both this and breakfast into Baby Boy's morning nap. The trickiest part was sewing round those tight curves at the neck, combined with the lightweight fabric that my machine wanted to chew. I ended up doing one stitch, then pivoting a small degree, one stitch, pivot... and even then it's still not particularly curved, or neat! The fabric is pongee lining in blue and red. In fact the same blue pongee I used for his Wise Man headdress. At something like £2.99 a metre, it's great stuff for fancy dress! It's a bit easier to sew with than regular poly lining as, due to the fact that it's not shiny, it doesn't slip around too much. It also doesn't fray as much. On to the "goggles". I'm not exactly sure what he had in mind initially. He still quite often, rather endearingly, gets words confused: recent examples include confusing "awesome" for "moss" (as in "mummy, there is awesome on the ground"), and calling courgettes (zucchini) "tagine". Luckily, regardless of what he had in mind, I managed to persuade him that an Incredibles style mask was what he needed. One quick Google later, and we rustled these up from black felt and 1/4 inch elastic. The cape was an immediate hit. He wore it into town, under his coat, the day I made it. The mask is less successful. He has super long eyelashes (like, ridiculously long), and I think they kind of get in the way of having things close to his eyes. We *may* have also dressed Baby Boy in the cape to make Superbaby, and made him fly round the livingroom, but there is no photographic proof of that. I liked the idea of making the cape double sided, so he could choose which side to wear. I also, somewhat naively thought that the blue side would double as an Elsa cloak (no gender stereotyping around here! ), but I was told in no uncertain terms that it was too short for an Elsa cape. Luckily there was a plan in place for that. He's really happy with the fabric, so I offered to just neaten it up a bit. I overlocked the raw edges, and cut a circular shape out of one short end (kind of similar to the cape) to allow for his neck. I added a small square of velcro and we were done! Small Boy is delighted with both "costumes" and is a very happy boy! "Cold never bothered me, anyway!" *If you are lucky enough to have never watched Frozen, then apologies - absolutely none of that will have made sense to you! I did some major power sewing through December. I got a bit carried away with plans, as I am wont to do, but this time I kind of had to deliver due to various deadlines! I've covered the Birthday Dress and the Nativity costume - next this True Bias Sutton blouse! I did like this pattern when it was first released, but it only became high priority when I saw Caroline from Blackbird/Sewaholic's make, which I absolutely loved and which became my inspiration. My version is made from a poly crepe (this) and this lace, both from The Cloth Shop in Edinburgh, which is part of Remnant Kings. Yes, I know! I bought polyester!!! It was the colour that sold it. Recently I have, rather usually for me, been drawn to monochromatic and darker colours, and this just felt like such a happy antidote to that. It actually made me smile when I was sewing! Love it!!! I couldn't get an exact colour match for the lace, but love the contrast this provides. The Sutton is a really simple, straightforward and quick make. Unless you stupidly French seam the back bodice piece on backwards. Harrumph. Well I figure there's got to be at least one stupid mistake per make as far as I'm concerned. Anyway. My first True Bias pattern. I like Kelli's attention to detail on finishing details. The side slits at the hem are finished so nicely and neatly, which I find really pleasing, as I do the French seams, and the method she uses to attach the bias facing. Weird neck/face thing going on here, but you can see the sleeve and kind of see the hi-lo hemline. It was my first time sewing with lace, other than a previous fancy dress outfit (not real sewing!). I made absolutely no attempt to do any research on it and jumped right in. The lace has a lovely scalloped selvedge that I hoped to use as the sleeve hem, but the back yoke is cut in one piece, which would have meant piecing the lace. I did do some reading on that, but quickly realised that the repeat was not exactly the same on each selvedge. And to be honest, I really didn't have the time, so I let myself off the hook, cut the yoke as directed and it seemed to work out ok. I think it might have stretched out a bit, so next time I might stay stitch all cut edges, but otherwise it was fine. I think the blouse took me a few days to make, but my sewing time is in fits and bursts - an hour or 2, here and there during nap times and in the evenings. And then there was that back on wrong side out incident to correct. The colour is way off on this and the subsequent photos. The earlier photos are closer to the real colour. The crepe is lovely and drapey, but it isn't particularly lightweight, so it's probably not ideal for the top. This is probably the main reason that I am actually a bit meh about the make. I don't know why. I love the colours, like the shape, but I am just not that excited about it on me. If I'm totally honest, it actually reminds me of scrubs, albeit posh ones. Just as well it's not blue!!! I don't think that about anyone else's version, just mine, so either it's the fabric, or the v neck, which is a shape I don't often wear. Side slit finish - whoops wonky hem stitching there too! Bias facing on the neckline. My V wasn't perfectly matched, but not bad. With a lighter weight fabric this would be easier. The side seams can't be french seamed due to the slits at the bottom, so I used the overcast stitch on my sewing machine. I wasn't happy with the finish so turned and stitched as well. Anyway, my husband convinced me it was nice, and to be honest, I had a night out and nothing else to wear! But my friends all loved it too, so I am going with popular consensus that it's actually OK. Do you ever get that? You don't love an item of clothing but others talk you in to it? I'm still undecided, but will wear it because I love the colour, and it's nice and easy to wear with jeans - and with a cardigan hiding the lace, it dresses it down a bit for daytime. Not that you can't wear lace in the day, but small fingers like to pull and small teeth like to bite! And what did I wear the Sutton with on my night out? Well, halfway through making it, I realised I didn't have anything that wasn't jeans that would go. So I made a skirt. In an evening. The inspiration for this came from the RK blog, via Hazel. I was convinced scuba wasn't for me, until she showed me the tutorial. It obviously stuck in my head because when I was deliberating on what I could wear with the blouse, this was what I thought of first. I didn't actually follow the tutorial. Instead I used the Colette Mabel skirt - the short version, as that was what I had printed - which I lengthened. I can't remember by how much, as this was very much fitted on the hoof. I cut the back on the fold instead of cutting 2 pieces because I didn't read the pattern pieces (told you: one stupid mistake per make), so they then ended up too big, as there was seam allowance included that I didn't need, but I just removed that as I fitted it. I have small hips relevant to my waist measurement, so even though I graded down a size at the hips, I still had to take quite a it more there too. I think about 4cm through the waist and hips. It was all sewn on my sewing machine using the lightening bolt zig zag. Raw edges are unfinished. The hem is twin needled. The waistband is faced with a much lighter weight jersey, to reduce bulk, but it's too lightweight for the scuba and has a much higher stretch percentage, so it doesn't work well. Inside waistband and side seam. I think in retrospect I could have done with taking it in slightly more at the waist/hips. It was fine for dinner with the girls on Friday night, but at my Mother In Law's 60th birthday party the following night, it didn't quite pass the Mr Brightside dancing test*. But OH MY GOD, scuba is THE most comfortable fabric ever! It is thick enough to cover all lumps and bumps, but stretchy enough to permit walking and dancing and eating. I even wore it on Christmas day. So, there you go - a Christmas outfit, sewn in a week! * Mr Brightside by The Killers - the only acceptable dance to this is to jump up and down like a lunatic, punching the air where appropriate, for as much of the song as your fitness levels permit. Clothes therefore need to be able to stay in place without adjustment. This year, I made my 3 year old niece (who I shall henceforce refer to as the Little Star) a Christmas present. She is really into bags, and has quite a few shoppers, but I thought she might like more of a handbag style bag. I did a bit of Googling, and a bit of Pinterest surfing and found this tutorial, which fit the bill perfectly. I have a bit of an aversion to the "pinkification" of wee girls, so I have to admit I do go out of my way to avoid pink when I buy anything for the Little Star, hence the fabric choice. Luckily she is OK with this, so far. The bag was really straightforward to put together, although it took considerably longer than the hour suggested in the tutorial. I think it took one hour to cut and prep the fabric, and then a full second evening to do the sewing. But, I have said before, that I am not the speediest of sewists. The tutorial calls for you to interface the fabric, but instead I decided to use batting. My mum actually gave me this really cool iron on batting. No idea what it's called or where she got it, and she only had a scraps left, but it was enough. I didn't quilt the bag, but I like the additional structure that the batting gives it. The bag closes with a fabric loop (a chunky rouleax), which loops round a button. Both fabrics are from Remnant Kings, as is the button. I know the orange button is a bit random, but I couldn't find a green or blue button that matched, and actually I quite like the pop of the orange. I also just really wanted to buy that button. As you can tell from the photo, I didn't waste too much energy on pattern matching or placement. I did manage to get the horizontals matched at the side (no photographic proof) but that was about it. I don't think the Little Star minds too much. A better pic of the lining fabric. I love that scallop print! There really isn't an awful lot to say about this pattern. It was a straightforward sew and the instructions are clear, logical and give good, well finished results. If I was being picky, I'd say that it's a little bit annoying that the lining is the same size as the outer, as it just doesn't sit inside neatly, but that's an easy fix if I ever make another. 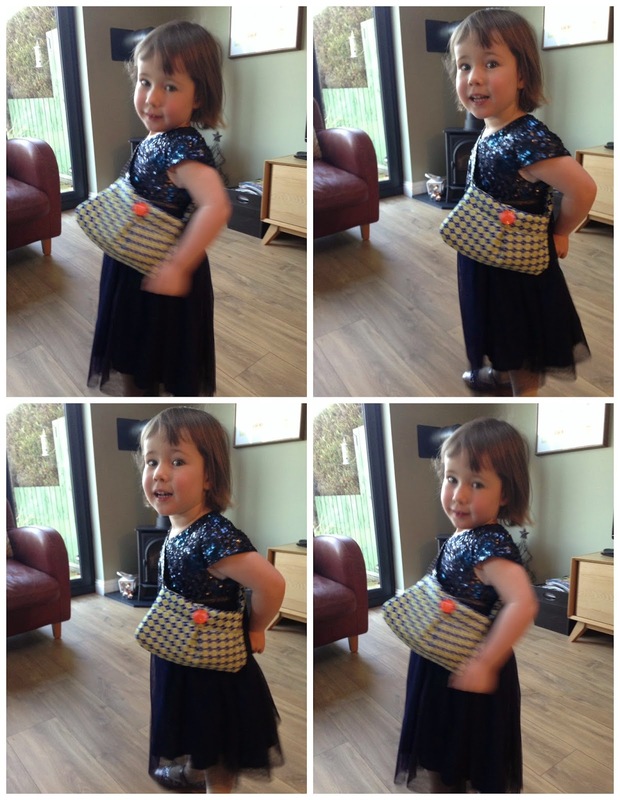 I decided the Little Star might want a grown up bag a bit like Mummy's, so I filled it with a few bits and pieces. Miraculously, on Christmas day, I got a compact mirror in my cracker, and so gave that to the Little Star for her bag as well. The bag was a huge hit. It's meant to be a shoulder bag, but my Dad didn't realise that and so put it on her cross body style, and there is stayed. She pretty much wore it all day, and spent a good chunk of the evening brushing and combing everyone's hair! I have a few half written, or fully written but no-photos-taken posts in draft currently. The laptop issue actually has nothing to do with lack of photos - blame the appalling weather for that one - but, as I've moaned about mentioned before, I cannot fully write a post from my iPad as I can't add links, formatting etc on the Blogger App. Really? Still?! Anyway, its that time of year when everyone writes their review of 2014/plans for 2015 posts. I wasn't planning on doing that. 2014 wasn't a "typical" sewing year for me (whatever that is), as I had large periods of no sewing (pregnancy tiredness, working full time, new baby), followed by short bursts of intensive sewing (start of mat leave pre-baby, December craziness), and I never really set any goals for the year anyway for exactly that reason. Furthermore, 2015 will throw up some further challenges, and I have no idea how that will affect my sewing time. In May I will go back to work. I don't yet know if that will be full or part time. In August, Small Boy will start school, meaning a whole new episode of our lives and different childcare, thus I will be dropping off/collecting 2 children from 2 different places every working day. In June this year my husband started a new job where he works remotely, and spends a lot of time travelling. He's been away pretty much 5 days a week, every week for the past 3 months. So, it's odds on that I'll be doing all of the above myself. I'm not sure how much time that's going to leave for sewing. Still, I remain optimistic. I might need the sewing to save my sanity! Considering all of this, I feel there is little point setting myself goals. I know I enjoy sewing best when I am free of constraints and deadlines, so why stress myself further? I have sewing goals that I would like to achieve AT SOME POINT, but I have plenty of time for them. Instead, for 2015, I'd like to focus on creating space, both literally and mentally. Finishing all the WIPs, mending jobs and promised but not yet fulfilled projects. I'd like to spend some time clearing out my sewing storage space (bit of the hall cupboard), getting things in order and establishing what exactly I have - and then to try to use up my stash where possible. I can't afford the luxury (financially or spacially) of a large stash, and to be honest, I just find it a bit stifling, so I think it would do me good to clear as much as possible: to give my sewing and my creativity room to breathe and develop. Our hall cupboard - AKA my sewing storage, I am ashamed to admit! For my recent birthday, I received money, which I plan to spend on a new camera. Our current camera is about 8 years old, and the photo quality is pretty poor. I've recently taken to using my phone for blog photos as the quality is much better. So my last aim for 2015 is to get round to choosing and buying a new camera, and then learning to use it. I think I want a bridge camera - a step up from a point and click, but easier to lug around and to use than a DSLR (I am not a photographer, but I'd like to learn a bit more), and it seems that a bridge would give that. If any of you have any recommendations or suggestions, feel free to let me know in the comments. What camera do you use? (I also asked this recently on Instagram, so apologies for the repetition if you already saw that there). So, that's me. I am enjoying reading all about what everyone else is planning for 2015 and can't wait to see what progress everyone makes. Good luck to us all! 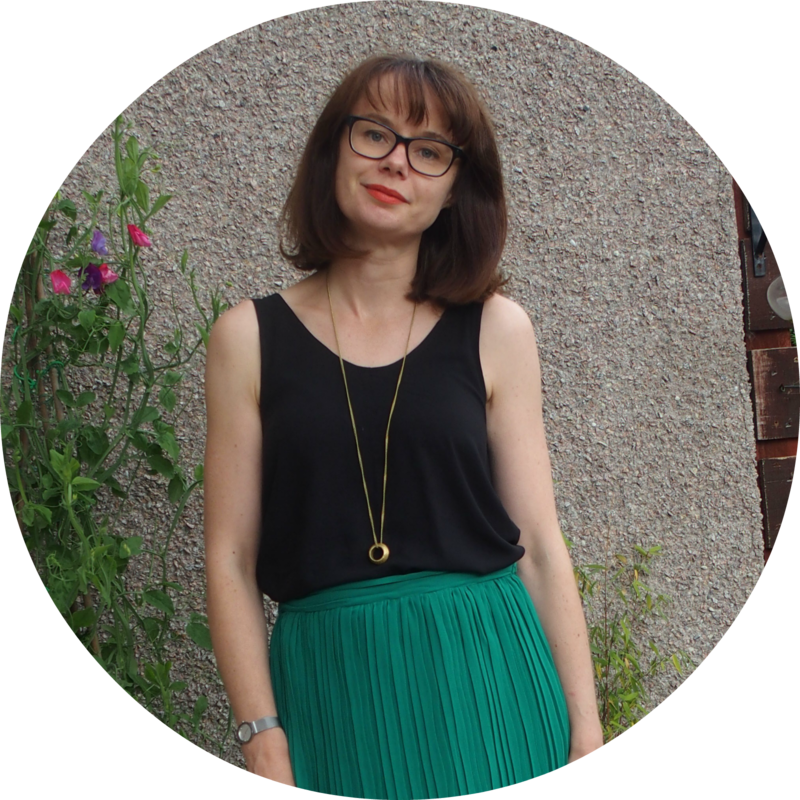 Haberdashery heaven, a featured post and Bloglovin frustration! © Grosgrain Green | All rights reserved.